« Worrier or Warrior 1…..
Voodoo, we do, you do!….. In Washington DC at a Metro Station, on a cold January morning in 2007, this man with a violin played six Bach pieces for about 45 minutes. Approximately 2,000 people went through the station, most of them on their way to work. After about 3 minutes, a middle-aged man noticed that there was a musician playing. He slowed his pace and stopped for a few seconds, and then he hurried on to meet his schedule. The violinist received his first dollar. A woman threw money in the hat and, without stopping, continued to walk. At 6 minutes – a young man leaned against the wall to listen to him, then looked at his watch and started to walk again. A 3-year old boy stopped, but his mother tugged him along hurriedly. The kid stopped to look at the violinist again, but the mother pushed hard and the child continued to walk, turning his head the whole time. This action was repeated by several other children, but every parent; without exception – forced their children to move on quickly. At 45 minutes – the musician played continuously. About 20 gave money but continued to walk at their normal pace. He finished playing and silence took over. No one noticed and no one applauded. There was no recognition at all. 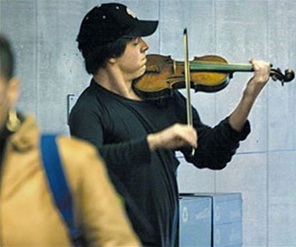 Two days before, Joshua Bell sold-out a theatre in Boston where the seats averaged $100 each to listen to him play the same music. Enjoy life NOW….. it has an Expiry Date! When I was 5 years old, my mum told me that happiness was the key to life. When I went to school, they asked me what I wanted to be when I grew up. I wrote down "happy". This interviewer’s laughter is infectious. It had me, and I know many of you, in tears. They are from a book called Disorder in the American Courts, and are things people actually said in court, word for word, taken down and now published by court reporters that had the torment of staying calm while these exchanges were actually taking place. WITNESS: He said, “Where am I, Cathy?" WITNESS: Your Honour, I think I need a different attorney. Can I get a new attorney? ATTORNEY: ALL your responses MUST be oral, OK? A heartfelt thank you for all your messages and contributions this year – I appreciate each and every one – and for allowing me to share my musings with you. Ps. 2 books based on my "Adventures in Awesome Living" column will be published early in the New Year. They’re entitled "The Art of Awesome Living" and "The Book of Awesome Humour". If you enjoy this column then I’m sure you’ll enjoy the books. If you want to know when they’re published then ping me an e-mail: sunil@sunilbali.com . This entry was posted by Sunil Bali on December 18, 2011 at 6:00 am, and is filled under Mindset, Set & Match. Follow any responses to this post through RSS 2.0. Both comments and pings are currently closed.